I have been having the worst makeup days ever recently. I’ve become really lazy with perfecting my face and so within a couple of hours I usually look completely washed out. After a couple weeks of barely wearing makeup you’d think that I would be all about the makeup at the moment but I’m really struggling to find the motivation to stick to more than just a half-assed base. Luckily for me it’s at least been staying put thanks to a new miracle worker cream that’s (dare I say it) better than your bog standard Primer? For the past couple of weeks I’ve been trying this new cream, that although smells a little funky at first has been an absolute dream to work with. The latest beauty craze to hit the industry recently has been that of the Aftershave Balm as a primer. Loved by the likes of Nikkie Tutorials this craze shows how Aftershave Balms stick to your foundation to give a flawless finish. Lotil is a multi-purpose cream packed with Glycerin (which is the magic ingredient in Aftershave Balms) that also has the hydrating edge making it the perfect beauty companion! I’ve been using mine now for almost a month and I have to say that the longevity of my foundation has been amazing whilst I’ve been applying my Lotil cream. I’ve been really impressed by it and honestly never would have thought that a cream like this could do the jobs (and better) that your expensive branded Primers can. Forget your £20+ on a primer that would only see you out around a month, Lotil is available in Boots for £3.59 for 50ml – SAY WHAT?! For my Foundation I’ve continuously been reaching for the Clarins Everlasting Foundation+ , my all-time favourite and something that I would easily accept a life time’s supply of in a heartbeat. I absolutely adore this foundation and couldn’t ask for a better coverage. It’s such a great consistency and glides on the face so easily. You can read my full (but very old) review of the Clarins Everlasting Foudation+ here for more details as to why I am obsessed with this base! Contouring and Highlighting have been two techniques that I have been trying to master lately and I have tried and tested a million and one products that have and haven’t worked, but over the last two weeks I feel like I have found the perfect combination! The Maybelline Dream Bronzer is something that after my teenage ‘Dream Matte’ days I never thought I would use, however after my Mum picked it up for me in a surprise Boots trip I started using it and absolutely fell in love. The creamy texture is one of the softest and easily bendable that I’ve tried and I absolutely love the colour and longevity of the product. I barely ever have to reapply or touch up and it’s so much better than the powder bronzers I’ve been using lately. For my highlight I’ve been using something pretty basic; the Collection Perfection Lasting Concealer is what I’ve been picking up to highlight in the areas under my eyes and along my cheek bones, on my forehead and just on my chin. It’s been amazing to blend in and show a natural contrast between that and my new bronzing contour! I’ve been really loving these products as my base for a while now and don’t really want to try anything else. I feel good just wearing this and a dash of mascara and I definitely haven’t felt like I’ve been able to do that for a while! 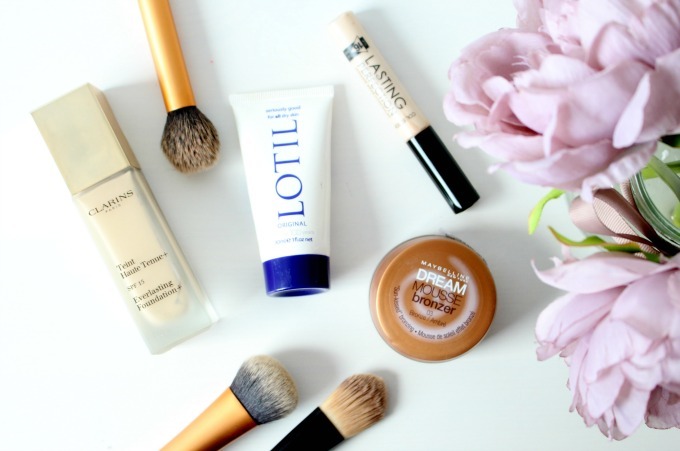 Have you got your perfect base sorted? What are your go-to golden products?